When we make a decision to form a partnership, we carefully review the company philosophy to make sure it aligns with ours. We’re fortunate to have found and signed strategic partnerships with some of the industry’s leading software and consulting companies. These partnerships allow us to implement the latest technology and methodologies in the field of CRM, and to better serve our customers. Founded in 2006, Radian6 was created with the idea that companies need to be listening to the social web in order to effectively participate. Intelligence about online conversations is critical: companies need to know what’s being said about their brand, industry, and competitors online. Radian6 has a listening platform designed to help companies do just that. Aplicor, Inc is a is the most awarded hosted CRM software and ERP/financial accounting solution in the software-as-a-service (SaaS) industry. Online software unique strengths include ease of use, business process automation and business intelligence. SalesForce.com is the leader in providing applications for redefining success for customer relationship management (CRM) ranging from sales force automation, to partner relationship management, marketing, and customer service. 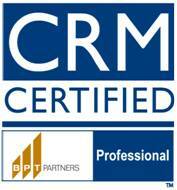 BPT Partners is one of the world's leading authorities on Customer Relationship Management. Our distinct "customer-centered" approach in training and education, consulting and research adds immediate and long term value to our clients. Customers Forever, LLC. In alliance with Approach Technologies, Solvis is one of the founders of Customers Forever, a CRM association for the Latin American region. SAS Institute. Solvis provides SAS Marketing Automation consulting and implementation services to SAS and its customers as a service provider vendor. Amdocs/Clarify. Solvis provides Clarify consulting and implementation services to Amdocs in telecommunication projects in United States. CRM Mastery. CRM Mastery offers a suite of four diagnostic CRM Assessment Solutions that will quickly and easily provide you with an astounding level of insight into your current CRM situation. Approach Technologies. Founded on 2002, Approach Technologies provides Call Center and Contact Center solutions for the Latin American market. Solvis is member of the Direct Marketing Association and part of the The DMA Customer Relationship Management Council. Go to Link section in our site to know more about these partners and other vendors that we had worked with.